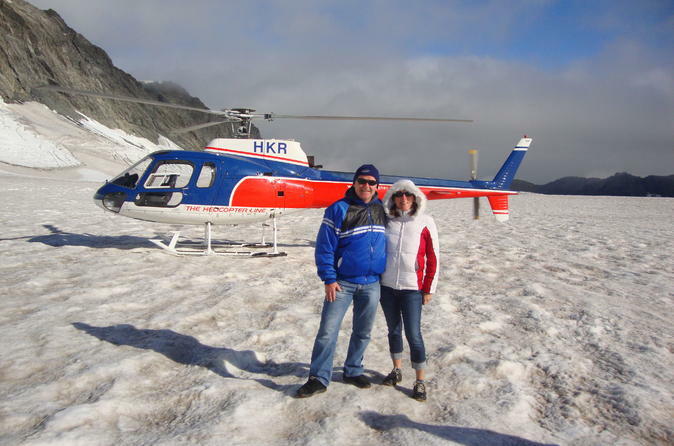 Start your Southern Alps glacier discovery at the nearby Fox Glacier helicopter base for your 30-minute flight. Strap yourself into your seat and prepare for a once-in-a-lifetime ride, soaring above the pristine scenery of New Zealand’s Franz Josef and Fox glaciers — the result of millions of years of geologic change. En route, listen to live narration from your experienced pilot and gaze out the panoramic windows to find a stunning frozen landscape below. 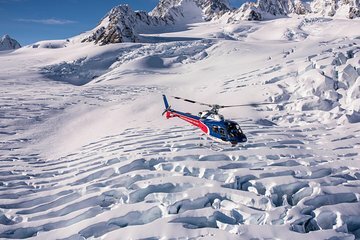 Your helicopter hovers above a mantle of sheet ice and snow, then makes a thrilling snow landing at the summit of either the Franz Josef Glacier or Fox Glacier. Hop out to get up close to the breathtaking scene, including shimmering blue icefalls, ice caves, deep crevasses, pinnacles and seracs. Take some time to pose for photos, capture the alpine terrain on camera and take in the mountaintop views over the valley beyond. After, settle back inside your helicopter for the short flight back to the base. The helicopter flight was excellent - well worth doing. The Helicopter Line crew were professional, and the flight wet too quickly. It was great landing on the Glacier- we had a beautiful sunny day. Plan your trip for the morning as the weather appears to turn for the worst after midday. Excellent, good pilot, amaizing views, worth every penny. As the Helicopter takes you up over the glaciers you get an absolutely breath-taking view of the stunning ice walls and crevices of this majestic work of Mother Nature. Then you land on the top of Fox Glacier to take in the serenity of the snow and ice where the Glacier starts. We had a stunning day when we did this tour, so got to see it at it's very best. Absolutely amazing!!! However weather conditions can change very rapidly over the Alps so be prepared for your Tour to be cancelled and rescheduled. It is not safe to fly in cloudly or windy conditions, so it is simply something that is out of the control of the Helitour company and they have your best interest in mind, so just bear that in mind if you have to reschedule. It is reasonably expensive to do this activity, but believe me it is worth every cent once you have done it!!! Breathtakingly, amazingly beautiful. Mother Nature at her very best without a doubt. We were lucky with the weather which was perfect and the views were astounding, our pilot Richard was very informative with his knowledge of the ares and the flight was very comfortable. The experience was very enjoyable. The most amazing experience our family has had! Worth every.single.cent! Wish we had taken the longer trip. If travelling to the South Island in New Zealand, be sure to take a flight to the glaciers from Franz Josef. A great little town and amazing scenery. Unfortunately we struck bad weather and were only able to do a 10 minute flight of one glacier Franz Josef and weren't able to land.